We have our Papilio DUO development environment up and running (I hope), so let’s try to get something simple working. In this post, I’m going to follow Jack Gassett’s “Hello World” video with the walkthrough adapted to my (Ubuntu) environment. A side note for anyone using a multi-monitor setup like me: if you move any of your DesignLab windows to a different display, weird things will happen and the program will become unusable. DesignLab will automatically detect the location of ISE. You can confirm this by going to File | Preferences. In the Preferences window, the value of Linux ISE location should be set to /opt/Xilinx/14.7/ISE_DS/ISE/bin/lin64 or wherever your ISE installation is to be found. Once the new window opens, you should be able to close the original DesignLab window. Save the file using Ctrl+Shift+S and click OK to save the project under the default name New_Blank_Circuit. This will create a directory with location $HOME/New_Blank_Circuit containing an New_Blank_Circuit.ino file. The .ino file is a C/C++ source file containing some boilerplate code which we’ll replace in a later step. At this point, I separated the Papilio DUO from the Classic Computing Shield (as shown in the photo). I then connected the Papilio DUO board to a free USB port on my laptop using the mini USB connector and mini USB cable. 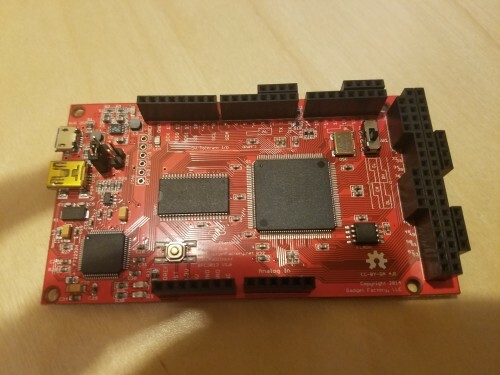 The mini USB port on the board connects directly to the FPGA whereas the micro USB port goes to the Arduino microcontroller. We’ll concentrate on the FPGA side of things to start with. A red LED lights up! Bus 001 Device 006: ID 0d8c:0005 C-Media Electronics, Inc.
From this we can conclude that the Papilio DUO corresponds to the Future Technology Devices International, Ltd entry. From this we can figure out the bus and device number for the board. I don’t know if this will be needed or not. My system shows an additional port (/dev/ttyUSB1 (Papilio DUO FPGA)). Without any more information, I chose the first one listed. Enter this and save it using Ctrl+S. This should open up a PDF rendering of the circuit in your default PDF viewer. Jack’s video give a very brief description of what the PDF shows you. Programming External Flash Memory with "/path/to/home/.local/DesignLab-1.0.8/libraries/ZPUino_Vanilla/circuit/DUO_LX9/papilio_duo_lx9.bit". Found Macronix Flash (Pages=32768, Page Size=256 bytes, 67108864 bits). Sketch uses 5,348 bytes (0%) of program storage space. Maximum is 2,048,000 bytes. Global variables use 1,092 bytes of dynamic memory. I suspect that I chose the wrong serial port in Step 5. So, I went back and selected to /dev/ttyUSB1 (Papilio DUO FPGA) from Tools | Port. I then clicked Upload again. Programming completed successfully in 1.73 seconds. And, lo, the monitor on /dev/ttyUSB1 will dutifully print out Hello World once a second! That gets us to about the 3min57sec mark on Jack’s video. I will pick up from that point next time.